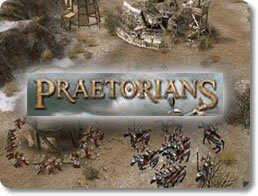 Praetorians Game Review - Download and Play Free Version! Lead the Mighty Legions of Rome to Glorious Victory! The time: 59 BC. The place: Cisalpine Gaul, a peaceful Roman province. The stakes: the fate of the known world! It is here, in this unassuming backwater of Roman-controlled territory, that you begin your quest to build a Roman Empire forged and strengthened in the fires of combat! An excellent real-time strategy (RTS) game, Praetorians places you in command of the most feared troops ever seen in the ancient world, the Roman legions. Will you become one of the greatest generals the world has ever known, or merely fade into the forgotten footnotes of history? Only time will tell! Play as Any of 3 Civilizations and in Multiple Modes! In the campaign mode of Praetorians, you command the vast armies of Rome in 24 scenarios based on what really happened. F ight the same battles as Julius Caesar himself, he who brought the Roman Empire together by cold steel and sheer willpower! The scenarios have varied objectives - defend against a siege, rescue an embattled ally, capture a certain town, and many others. Praetorians' campaign mode combines a rich, detailed storyline with historically accurate missions to bring you a game experience which is truly unlike any other! If the Roman campaign isn't enough for you, Praetorians also includes a Skirmish mode which lets you play not only as the Romans but also the Egyptians or the Barbarians, against up to 7 computer opponents on any of 16 maps. Each civilization comes with 13 unique units for a ton of strategic variety! For a new challenge, take your skills online in epic 8-player battles! Praetorians takes the focus away from tedious resource gathering and town building and places it on intense battle action! Unlike some other RTS games, you won't be successful if you just throw all your units into battle without plans or tactics. Instead, you'll need to think about the balance of infantry, cavalry, archers, and siege weapons in your army, and how to use them to maximum effect. Elevation also brings great advantages to those who have it, so make sure you hold the high ground because it could mean the difference between victory and defeat! Your road is long and arduous. It will take you through Gaul, Egypt, and Italy. Nobody ever said building an empire was easy! Vivid 3D Graphics Bring the Battles to Life! Praetorians fully immerses you in the ancient world. 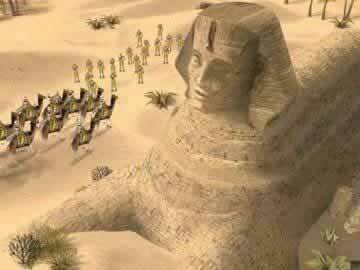 Travel to sandy deserts and beaches, icy mountainsides, dense forests, even the Egyptian Sphinx! The game is full of visually stunning environments and scenes of epic battle action complete with armies, towns, and fortresses. Fans of real-time strategy games, or of all things Roman: Praetorians is a game right up your alley. New to the RTS genre? Praetorians will give you a great introduction to this whole new world of gaming! Like Julius Caesar and his famous Roman legions, you too can live forever in the history books, only with Praetorians! Praetorians is a real-time strategy title which lets you take the reins during the glory years of the Roman Empire and Julius Caesar leads the Roman Army in Gaul. Praetorians differs slightly from other RTS titles in that the focus is all on combat and there is very little resource management or base building. In fact, the only resource in the game is the slow growing town populations which you can utilize only after capturing the settlement and building a barracks there. Other than a defensive tower, that is about all the base building you can do so the emphasis is really on the tactical combat which is very fun and addicting. There are the basic unit counters, such as cavalry are strong against archers but weak against pikemen and the like, but there are also several options with the different special abilities of your units. For instance, you can set your pikmen into a stationary position where they dig in their lances and are extremely effective at holding off both infantry and cavalry charges or legionnaires turtle formation which creates a protective shield around them to repel arrow fire. There is also a strong advantage with certain terrain features. For example the high ground is very beneficial since you are concealed from units below you and you can both see and shoot arrows farther from there. You can also set up ambushes in dense forests or have your archers lay down in the tall grass. These various options provide plenty of variety in strategies and gameplay situations which keeps things fresh and interesting. The only issue with such an emphasis on the terrain features and tactical advantages is that you cannot rotate the camera which hampers your effectiveness a bit, it is a bit annoying when you can't see some troops behind a small ridge. This isn't a huge detriment to the game since most of the gameplay is still quite enjoyable, it is just an inconvenience at times. Also, the only other problem with Praetorians is that the Multiplayer could be slightly easier to use since you have to use a third-party application to set up matches. These few problems don't impact the gameplay to a great extent and Praetorians does provide many satisfying RTS moments. 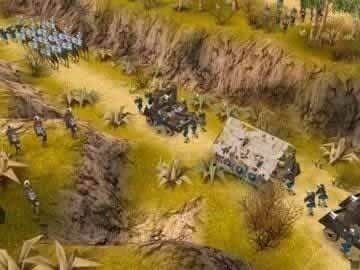 The intelligent use of terrain and units' special abilities add plenty of strategic depth and is perfect for RTS fans old and new. With a lengthy campaign, custom skirmish modes, and multiplayer options, there is plenty of action to be found and you're sure to get your money's worth.